Jon Gruden was a football coach nearly a decade ago. These days he's a broadcaster who gets very excited about stuff on Monday Night Football. He was 95-81 in 11 seasons as an NFL head coach, but because won a Super Bowl in 2002, many teams would love to have him take that job for their organization or school. Gruden's latest suitor was the Indianapolis Colts. They wanted him. He may have talked to them. He says he didn't. The truth doesn't really matter because he is staying at ESPN. His current contract runs through 2021. Just what is Jim Irsay thinking? In the aftermath of the the Indianapolis Colts’ second straight disappointing season, the owner seemed poised to bring back Coach Chuck Pagano and General Manager Ryan Grigson despite going silent on Black Monday, the day owners traditionally make big changes. It was curious. Baffling. Weird, even. Over the weekend, though, it became apparent that Irsay, like a duck paddling furiously, has a lot going on beneath the surface, reportedly courting Peyton Manning to return to Indy to head up football operations, a la John Elway in Denver, and wooing Jon Gruden as coach. Gruden has no such ties to the franchise and ESPN’s Adam Schefter reported that Gruden, the “Monday Night Football” analyst and Super Bowl-winning coach, turned down the job although he and Irsay met last weekend for 10 hours, per Indianapolis’s FOX 59 reporter Brian Bondus. Gruden, who remains ESPN’s highest-paid broadcaster, raking in around $6.5 million per year, began his NFL coaching career in 1998 when he took a job with the Oakland Raiders. After sticking around for four seasons, he moved to the Tampa Bay Buccaneers in 2002 and led the team to a Super Bowl win that season. Gruden, whose brother Jay is the head coach of the Washington Redskins, remained with the Buccaneers until 2009 when he was fired after overseeing what’s been deemed one of the biggest collapses in NFL history. After starting the season 9-3, the team ended on a four-game skid, and missed the playoffs. Gruden didn’t remain unemployed for long. By May 2009, ESPN scooped him up for its Monday Night Football broadcasts, where he’s remained ever since. Pagano came to the Colts in 2012, and led the team to three straight 11-5 seasons, although he missed most of his first season while being treated for leukemia. The Colts went to the AFC championship game after the 2014 regular season, but since then, they’ve twice finished 8-8 and a great deal of the blame for that has gone to Grigson, who hasn’t stocked the team with much talent. You can’t blame Irsay for wanting to bring in Manning, but why on earth would Manning want the job, given the roster deficiencies? And, like Gruden, the easy money that comes from TV (commercials, in Manning’s case) is awfully attractive. After an 8-8 season in 2016, Irsay elected not to part ways with general manager Ryan Grigson or coach Chuck Pagano, but has seemingly made a push to replace both. According to ESPN’s Adam Schefter, Gruden “resisted overtures” from Irsay and elected to stay in television rather than take over coaching duties with the Colts. But Glazer says Irsay is still hopeful that Manning could come on board, even if it’s a long shot. Manning, 40, was the No. 1 overall selection for the Colts in the 1998 NFL Draft and compiled a 141-67 record as the team’s starting quarterback. He is the franchise’s all-time leader in every major passing category and led the team to a win in Super Bowl XLI before eventually finishing his career with four seasons with the Denver Broncos, earning another ring with a win in Super Bowl 50. While in Denver, Manning had a 45-12 record as a starter for a team built by Broncos executive vice president and general manager John Elway, the team’s No. 1 overall selection in the 1983 NFL Draft and all-time leading passer. 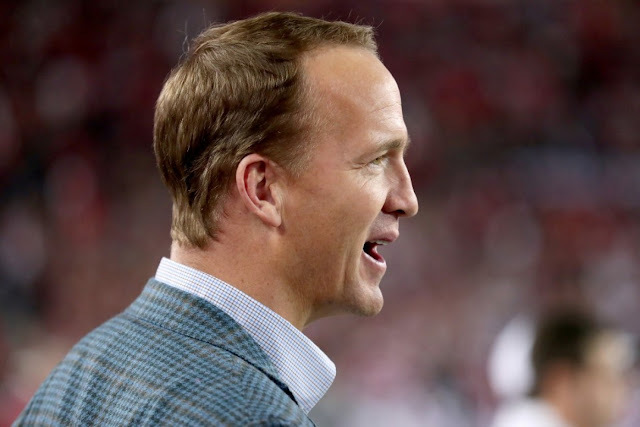 Manning retired from the NFL after the 2015 season and was reportedly pursued by CBS, ESPN, FOX and NBC for his post-football career, but turned down the television offers. A career in football like the one being offered by Irsay could be more up Manning’s alley and could be an escape from a Grigson era that has tailed after a strong start. 0 Response to "Analyst Jon Gruden staying at ESPN"